Guelph — It looked like a harmless shot. 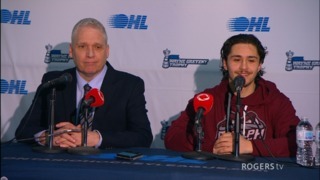 Guelph Storm forward Isaac Ratcliffe let the puck fly from just inside the blue line but the floater fooled Kitchener Rangers goalie Mario Culina. The veteran backstopper reached out to glove the biscuit but it bounced off his mitt and into the net Wednesday night at the Sleeman Centre. The marker put the Storm up 3-2 and Culina never recovered. 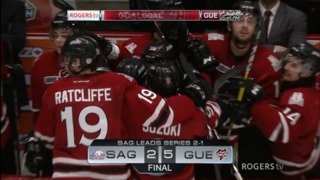 Guelph tallied twice more as part of a four-goal second period and beat the Rangers 6-4 to even the Ontario Hockey League western conference quarter-final at two games apiece. Credit the Blueshirts for battling back. Down 5-2, the visitors made it a game by picking up a pair early in the third period off the sticks of Joseph Garreffa and Kole Sherwood. 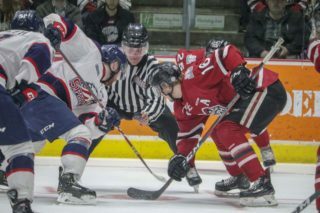 Kitchener even got a power play with about four minutes to go but couldn’t beat Guelph goalie Anthony Popovich, who made 39 saves for his second win of the playoffs. Suddenly, the second ranked Rangers are back to square one after winning the first two games and in a best-of-three race with the seventh seeded Storm. 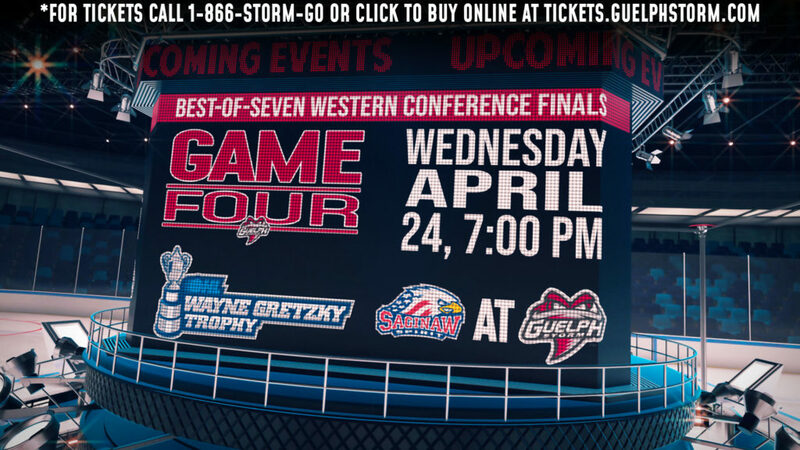 The rub is that Kitchener dominated most of Wednesday’s game. The team outscored the Storm 4-2 and outshot the hosts 34-9 in the first and third periods. 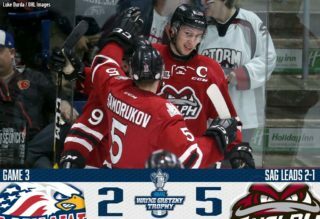 Liam Hawel’s empty net goal was the only shot by the Storm in the final 20 minutes. But that middle frame was costly. Culina had the best goals against average and save percentage in the OHL after two playoff games but has allowed 10 goals over two games at the Sleeman Centre. The overager was replaced by backup Luke Richardson Wednesday after his second period meltdown.